Mileage runs can be a funny thing. To some people it’s worth flying 48 hours straight in coach to rack up tens of thousands of extra miles for a few hundred dollars, while other folks do everything they can to avoid setting foot on a plane. Whether or not a deal is worth it to you depends on whether you want those miles, have the time and can spend a little extra cash to rack them up. 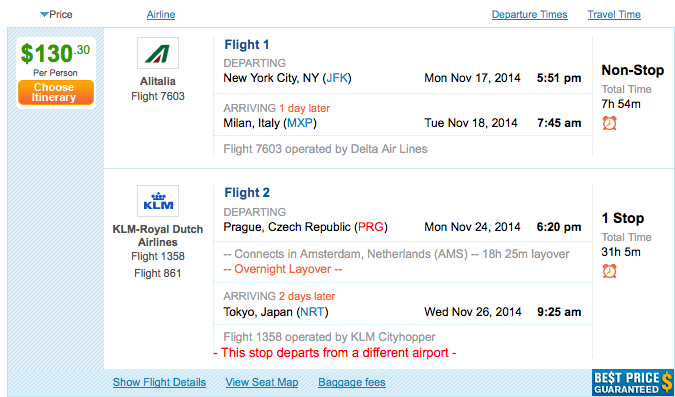 Fly from New York to Tokyo via Europe for as little as $130. Case in point, Mighty Travels points out a multi-city deal where you can fly from the US to Asia via Europe for as little as $130 one way in October and November! I did a quick search of itineraries myself and was able to find deals on several dates in October and November from both New York JFK and LAX. It looks like the lowest fares price out to Milan from New York, or to Budapest from Los Angeles, and then you can choose from any number of Asian cities including Beijing, Shanghai, Hong Kong, Guangzhou, Taipei, Osaka, Ho Chi Minh City and more. 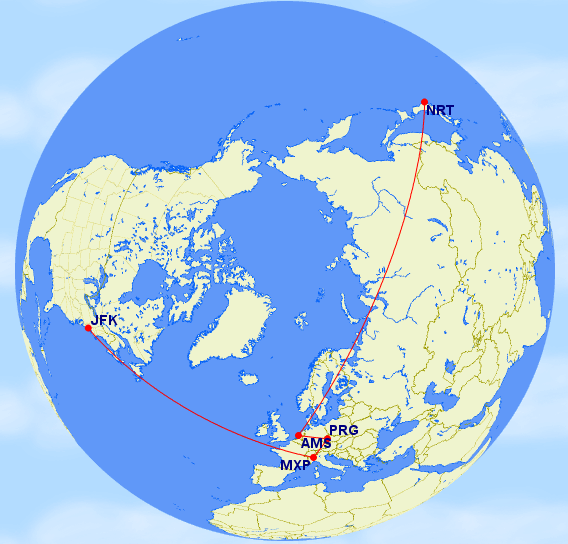 The routes that seem to work best are from New York JFK to Milan on either Delta or Alitalia, then departing from Prague and flying via Amsterdam on KLM to a variety of Asian destinations. Here are a couple sample itineraries I was able to price out for dates in October and November. 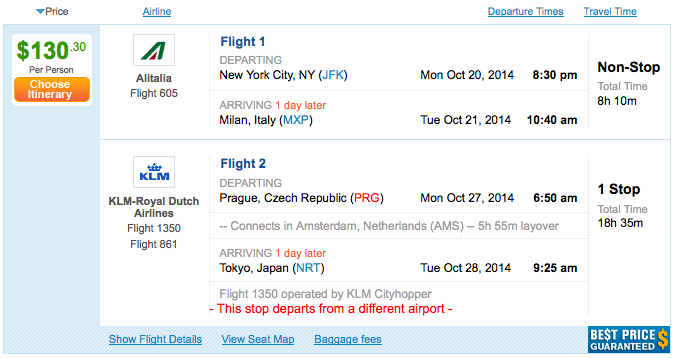 The lowest fares are $130 and are from New York JFK to Milan then continuing from Prague to Tokyo via Amsterdam. Here’s a sample itinerary in October. 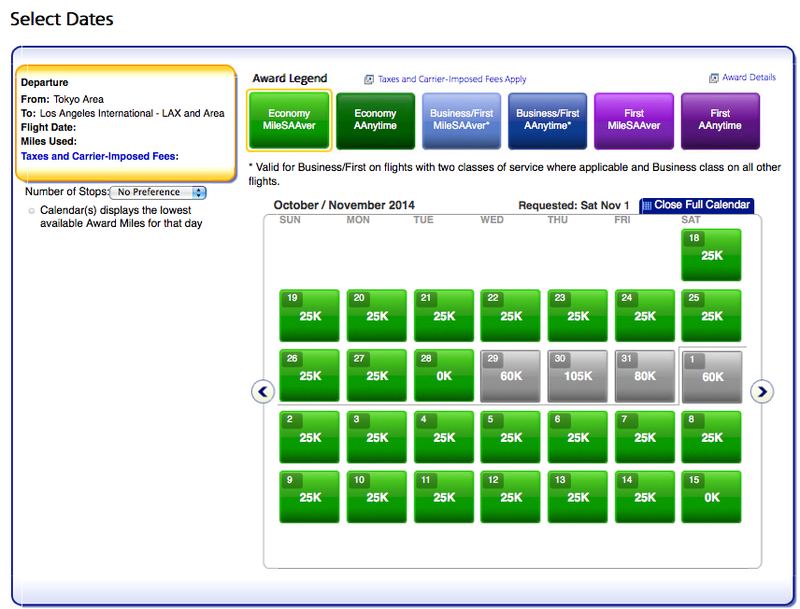 And here’s the same itinerary at the same price in November. 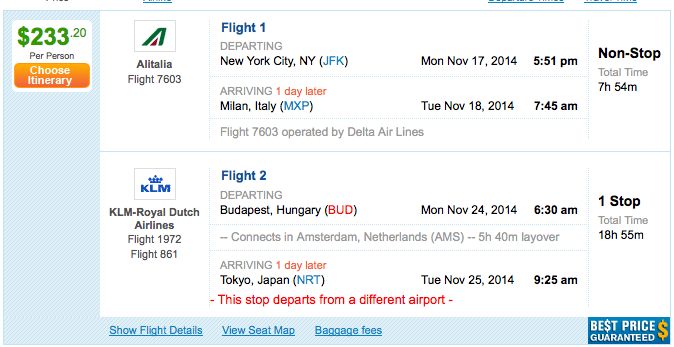 You can also depart from Budapest instead for about $100 more. 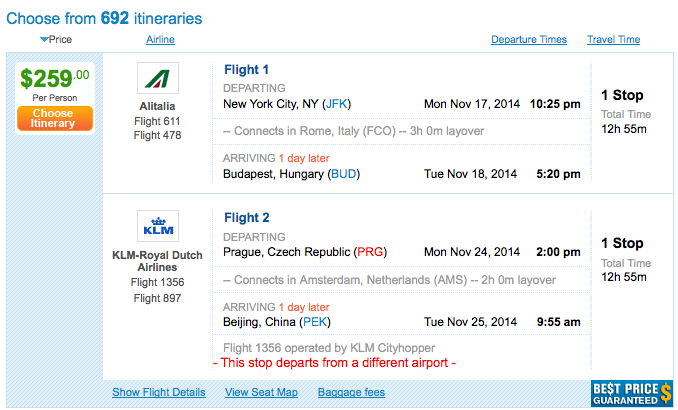 Or fly from JFK to Budapest and then leave from Prague and go to Beijing instead. 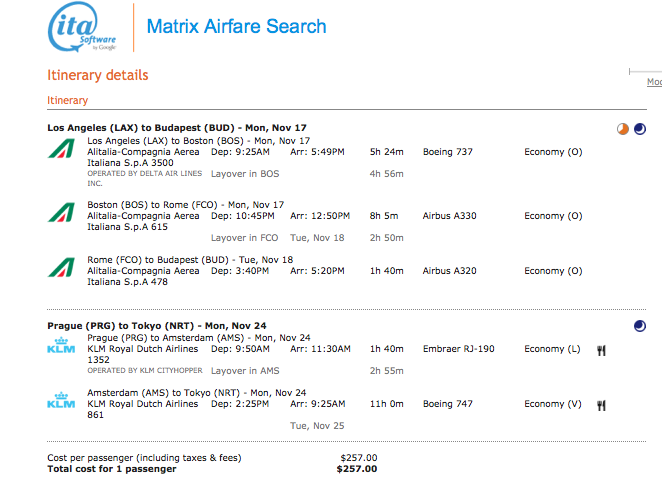 From Los Angeles, you can fly to Budapest and then continue from Prague to Tokyo for $280. Or to Beijing instead for $282. 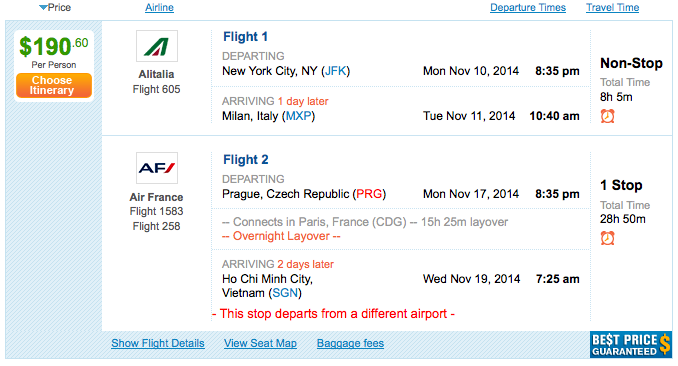 I also priced out JFK to Ho Chi Minh City via Milan for just $190. 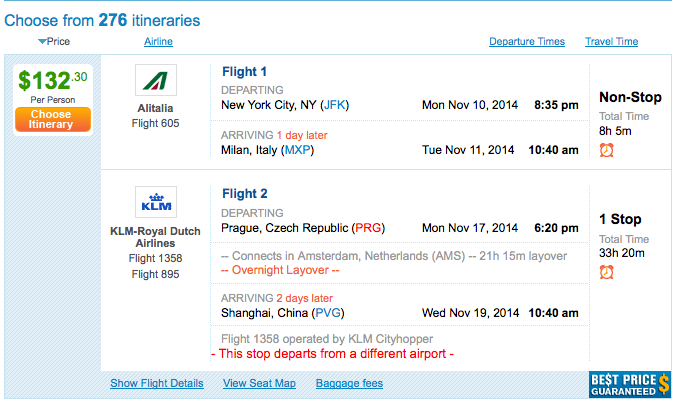 And from JFK to Shanghai via Milan and Prague for just $132. As usual with these deals, there are some major factors to take into consideration. First, as you’ll notice, you fly into one city but out of another on all these itineraries, so you have to get yourself from Milan or Budapest to Prague in order to catch your connecting flight. Not only that, but it seems like you have to spend a Saturday night in Europe in order to get these to price properly, so your trip will last at least several days – no hopping from one city to the next and flying around the world in a day. 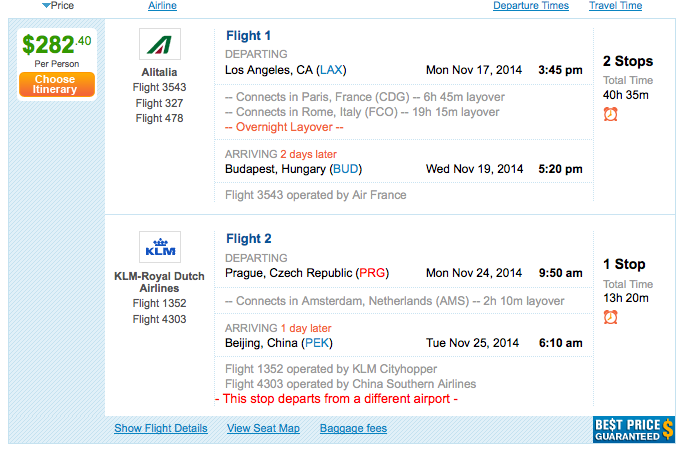 Second, there are some pretty long layovers involved in some of these itineraries. It might be fun to spend 18 hours in Amsterdam – enough for dinner and a night at a nice hotel – but you probably don’t want to get stuck at Rome Fiumicino for 6.5 hours, so pay careful attention to your routing. Though that’s obviously not an amazing deal and you won’t be earning any useful miles. You could also take advantage of Chase Ultimate Rewards adding Singapore Airlines as a transfer partner, and use your points to book an award on its routes from Hong Kong or Tokyo to San Francisco or Los Angeles, respectively. One reason you might consider doing this is to earn all that mileage. Unfortunately, since these are not pricing out on Delta.com, you must forego earning Medallion Qualifying Dollars (not that you’d earn that many on these low fares), but according to one itinerary I was able to price out on the ITA Matrix showed that the flights were all in O, L or V classes both on Delta as well as partners Alitalia and KLM, so that means all earn 100% miles and Medallion Qualifying Miles toward elite status. These fare classes earn 100% mileage. That means you can rack up tens of thousands of miles depending on your routing. 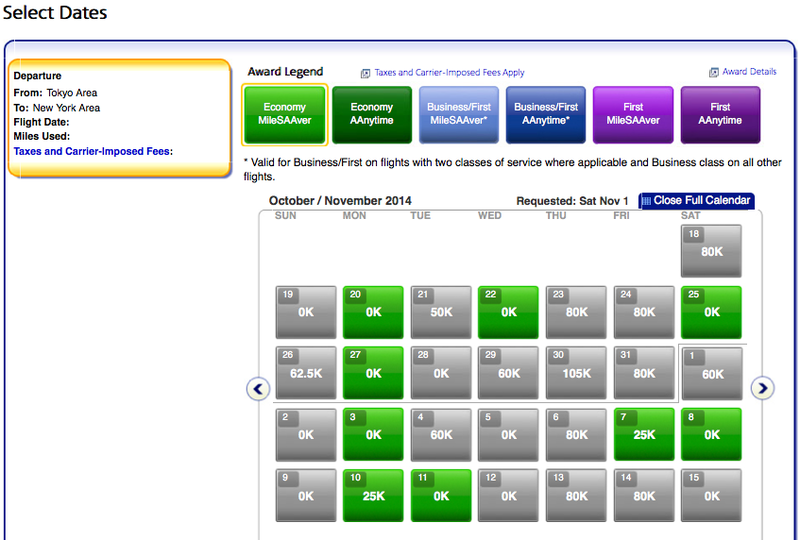 For example, the lowest $130 JFK-MXP-NRT fares net you 10,300 miles – that’s 1.26 cents per mile! 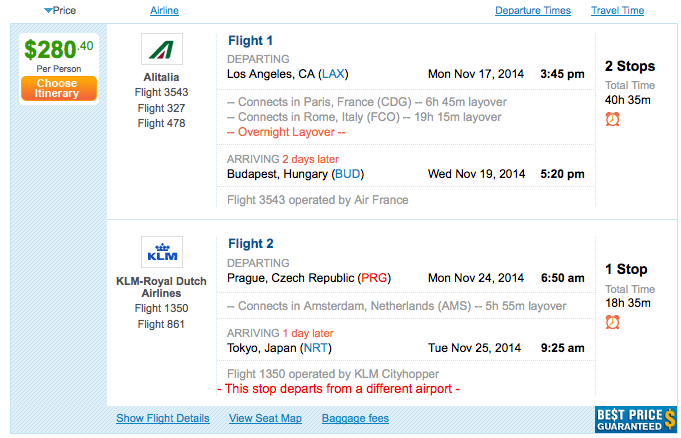 Los Angeles to Tokyo via Budapest and Prague? That’s 13,100 miles for $280 – that’s not quite as good at 2.1 cents per mile, but remember, it’s halfway to Silver Medallion qualification. Not bad at all. As always, whether a deal like this is worth it depends on your specific circumstances. If you’re gunning to earn a ton of Delta miles before the airline’s earning structure changes in 2015, and you’ve got a week to hop around Europe and then fly on to Asia, then you’ve got to find your way home. However, if you were planning a European or Asian trip in the fall, these might just be worth taking advantage of. Flights are definitely available from LAX and New York JFK, but you might also find deals from other US cities, and as I mentioned, it looks like you can get to a lot of places in Asia as well, so it’s worth playing around with and looking into for your specific interests. If you do book any of these, be sure to share your itinerary and experience below to help out other readers. Good luck!